Visual Lure was recently contracted to redesign a new website for Schwartzkopf Printing. We designed their original website way back in 2005. 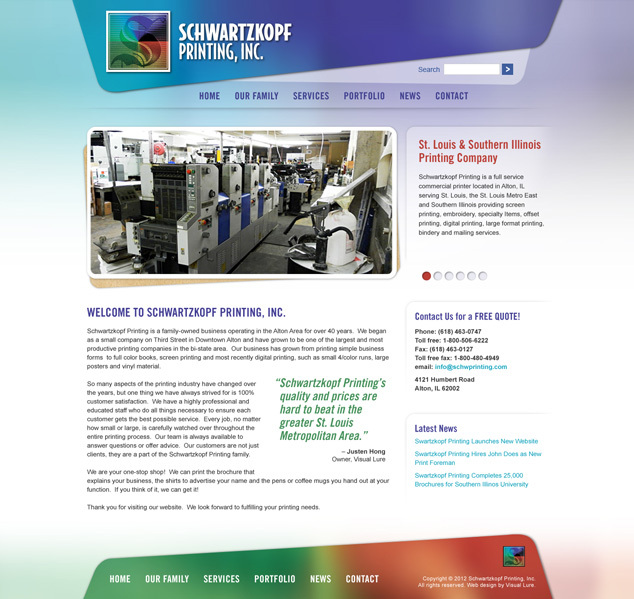 Schwartzkopf Printing is a St. Louis Metro East commercial printer located in Alton, IL that serves the entire Greater St. Louis Metropolitan Area and most of Southern Illinois. Their services include: screen printing, embroidery, specialty items, offset printing, digital printing, large format printing, bindery and mailing services. Below is a sneak peek at the new home page design. Check back soon for the official website design launch.